You attain your goal by acquiring the resources necessary for decorative lettering, hiring the best scribes, and reproducing the most precious works; however, you have a limited amount of gold at your disposal. Furthermore, you must maintain a rapport with the bishop, whose influence could make your library that much more glorious. The Scriptorium indicates how many Victory Points each of the 5 categories is worth. 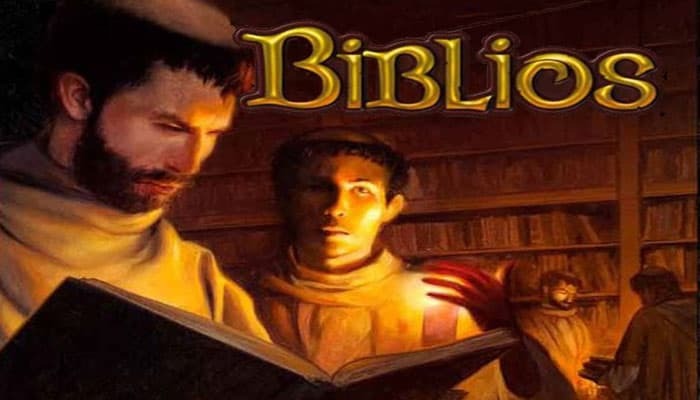 The goal in Biblios is to earn the most Victory Points. You earn Victory Points at the end of the game by having a higher score in a category than anyone else. At the end of the game, each category is worth from 1 to 6 Victory Points, which will be indicated by the dice on the Scriptorium. At the start of the game, all dice start at 3, but these values may change during the game. The player with the highest total points in that category will earn the Victory Points for it. The category of a card is indicated by its symbol and its color. Its value in the corresponding category is indicated by the number in the top left corner. The card presented here is worth 2 Manuscripts (orange). At the end of the game, the players add up the values of all their Manuscript cards. 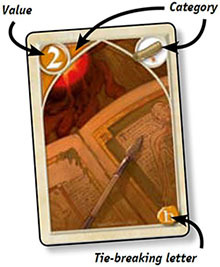 The player who has the highest total wins the category and scores as many Victory Points as indicated by the die of the Manuscript category. If two players are tied, the player who has the card with the letter closest to A wins the category. The other four categories are scored in the same way. During the Gift phase, players receive free cards. 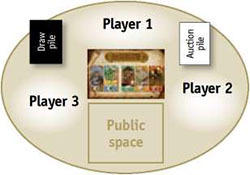 During the Auction phase, players purchase cards in an auction. Once these two phases are over, the winner in each category is determined and the corresponding Victory Points are awarded. The player who scores the most Victory Points wins the game. Place the Scriptorium at the center of the playing space and put one die on each of the categories, with the value "3" showing. Depending on the number of players, discard a certain number of cards from the deck (see chart on right). The random cards to be removed should be drawn from the entire deck and thus may include any types of cards. Then shuffle the remaining cards into a draw pile and place it face down. 2-player game: Discard 6 Gold cards (2 of each value), and then an additional 21 random cards. 3-player game: Discard 3 Gold cards (1 of each value), and then an additional 12 random cards. 4-player game: Discard 7 random cards. A game is split into 2 phases: Gifts and Auctions. Select the first player through a method of your choice (oldest player, for example). The player taking a turn is called the "active" player. 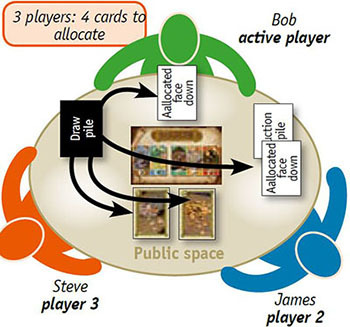 When you are the active player, you will "allocate" a designated number of cards (see chart below), and then give the remaining players an opportunity to draw a card from the public space. 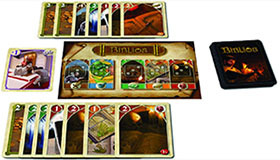 In a 4-player game, the active player allocates 5 cards. In a 3-player game, the active player allocates 4 cards. In a 2-player game, the active player allocates 3 cards. You must allocate precisely 1 card to the space in front of yourself and precisely 1 card to the Auction pile. The remaining cards must be allocated to the public space. After you have allocated the designated number of cards, the public space will always contain one card fewer than the number of players. The cards are allocated one at a time. Thus, you draw a card, look at it, and then place it into one of the three locations. The process is repeated, one card at a time, until you have drawn and allocated the designated number of cards. Note: At the start of the game, when the first active player allocates a card to the Auction pile, this will begin the Auction pile. This pile will grow as the Gift Phase continues and these cards will be purchased during the Auction Phase. Once you have allocated the designated number of cards, pick up the card that you allocated to your space, and add it to your hand. Then, starting with the player your left, each player draws a card from the public space and adds it to his/ her hand. In other words, after each turn of the Gift Phase, each player's hand will increase by 1 card. (See example on next page). Note: Players may look at the cards in their own hands at any time, but not at the hands of others. Once all the cards have been picked from the public space, your turn ends. The player to your left then becomes the active player. Players continue taking turns in the Gift Phase until the draw pile has been exhausted. Bob is the active player. It is a three- player game, so he must allocate 4 cards. He draws the first card, looks at it (and sees a "Monk 1"). He decides to allocate it to the Auction pile. He places it face-down in the Auction pile, so the other players do not see it. He draws the second card, looks at it, (a "Gold 1") and allocates it to the public space by playing it face-up on the playing surface. He draws a 3rd card, a "Monk 2", which he allocates face-down to the space in front of himself. He draws the final card of his turn (a "Gold 2"), which he must allocate to the public space, since the other options are no longer available. After allocating cards, Bob picks up the card he allocated to himself and adds it to his hand. James, on Bob's left, then chooses the "Gold 2" card from the public space, adds it to his hand. Steve takes the "Gold 1" card and adds it to his hand. Bob's turn ends and then James must take a turn. Note: The Gift phase is put on hold whenever a player acquires a Church card (see Special Rule for Church Cards). After the Gift phase, the Auction pile is shuffled to make up a new draw pile, and its cards are auctioned one at a time. The player who started the game as the first active player is the first active player in this phase, as well. On a turn, the active player reveals the topmost card of the draw pile and lays it face-up at the center of the table. Then the players bid for the card, following the rules explained below. Once the card is acquired, the next player (to the left of the active one) becomes the active player. Note: Because it is easy to forget who the active player is in this phase, we recommend that the active player put the draw pile in front of herself. The active player flips the top card of the draw pile face-up to begin an auction for that card. The player to the left of the active player must either bid at least 1, or pass. Then, in clockwise order, every other player either bids or passes. When bidding, you must bid higher than all prior bids in that particular auction. Once you have passed, you cannot bid again until a new card is being auctioned. Bidding continues in a clockwise fashion until only one player remains as the highest bidder. Note: If all the players pass without anyone making a bid, the card is discarded and the active player's turn is over. The highest bidder pays the bid amount by discarding a certain number of cards from her hand (see specific rules below) and adds the auctioned card to her hand. If the player cannot pay the bid, or chooses not to, she is penalized. The other players each take a card randomly from her hand and add it to theirs. The auctioned card is auctioned again and the penalized player cannot participate. The penalized player must discard 1 card from her hand, to be chosen randomly by the player to the left. The penalized player can't bid during that auction. The Auction phase continues until all the cards in the draw pile have been auctioned off or discarded. The players bid by announcing how much Gold they are willing to pay. When paying, highest bidder can use any combination of Gold cards from her hand. A player may be forced to pay more Gold than the bid (e.g., if a player bids 2 Gold, but only has a 3 Gold card). The player with the highest bid shows the Gold cards she is using to pay, discards them, and adds the acquired card to her hand. The players bid by announcing the number of cards they wish to pay. Players may pay with any types and combination of cards they wish. The highest bidder pays by placing the corresponding number of cards face-down in the discard pile, without revealing their categories or values to the other players. At any time during the game, as soon as a player acquires a Church card, the game is immediately put on hold while the Church card is played and then discarded. Note: A Church card is acquired when a player chooses it during the Gift phase, or wins it during the Auction phase. 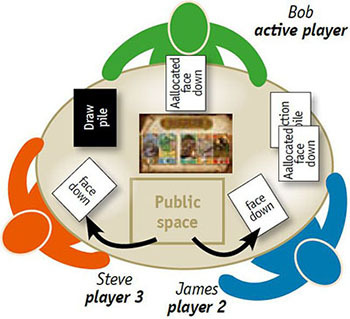 During the Gift Phase, a Church card is not acquired when it is drawn, but when the active player keeps it for himself or when another player chooses it from the public space. A Church card placed in the Auction pile is not played at that point. A Church card gives its owner the power to modify the number of Victory Points available by adjusting one or more dice on the Scriptorium. A player who acquires a Church card may decide not to use it, in which case it is discarded. 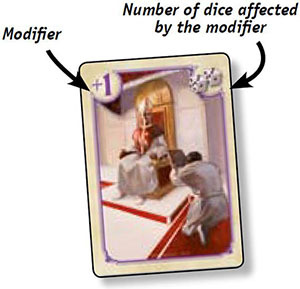 A "+1" church card with one die allows the player to increase the value of one category die by 1 point. A "-1" card with one die allows the player to decrease the value of one category die by 1 point. A "+1" card with two dice allows the player to increase the values of two category dice by 1 point each. a "-1" card with two dice allows the player to decrease the values of two category dice by 1 point each. A card with both the "+1" and the "-1" symbol allows the player to increase or decrease the value of one category die by 1 point. Once its effects are applied, the Church cardis discarded. Note: The power provided by a Church card with two dice must be used either on two separate category values or none. You may not modify one category value by two points. Once all the cards in the draw pile have been purchased or discarded, the players determine their values in each of the five categories. The players group their cards by category and add up the values in each. The player with the highest total value in a given category wins the Victory Points for that category and takes the corresponding die from the Scriptorium and places it in front of himself/herself , without changing its face. Note: The numbers on the cards are not Victory Points, they are simply used to determine who wins in each category. If two players are tied in a category, the player with the card in that category closest to the letter "A" (in alphabetical order) wins the category. After all the category winners have been determined, the players add the numbers on their dice. The player with the most Victory Points wins the game. If two or more players have the same total on their dice, the player (of those tied) with the most Gold wins the game. If there is still a tie, the player (of those tied) who had the higher total value in the Monk category is the winner. Ifstill a tie, use the tie- breaking letter to break the tie. 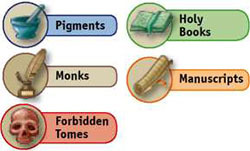 If there is still a tie because none of the players had Monks, use the next category on the Scriptorium (Pigments), then the next, etc. until the tieis broken.